The 2018 Centra Halloween Ball in aid of Offaly Hospice is back and promises to be bigger and better than ever. Now in it’s 10th Year, the night has become known locally as the Halloween event of the Year with amazing trips around the world to be won on the night sponsored by Musgrave Retail Partners Ireland, the Irish Travel Industry, and Multitrip.com. This year’s event will be held in the Tullamore Court Hotel on Friday 26th October. Last year’s event was a tremendous success with over 300 people attending, raising over thousands of Euros for Offaly Hospice. This year aims to raise over €10,000 for this very worthy cause. The event is organised by local Centra retailer, John Leavy and supported by the following Centra stores in the region, Scally’s Centra Tullamore, Flynn’s Centra Tullamore, O Callaghan’s Centra Ferbane, Mc Carthy’s Centra Kilbeggan, Baggot’s Centra Clara, Daniel’s Centra Portarlington and the Tullamore Court Hotel. The night will kick off at 7pm with a champagne reception, with Paul Skelton on piano before guests enter the Halloween themed ballroom where they will feast on a buffet and dance late into the night with entertainment by band, The LOL’s. There will be a prize for Best Dressed Male and Female on the night as well as some amazing spot prizes to be won over the course of the evening. 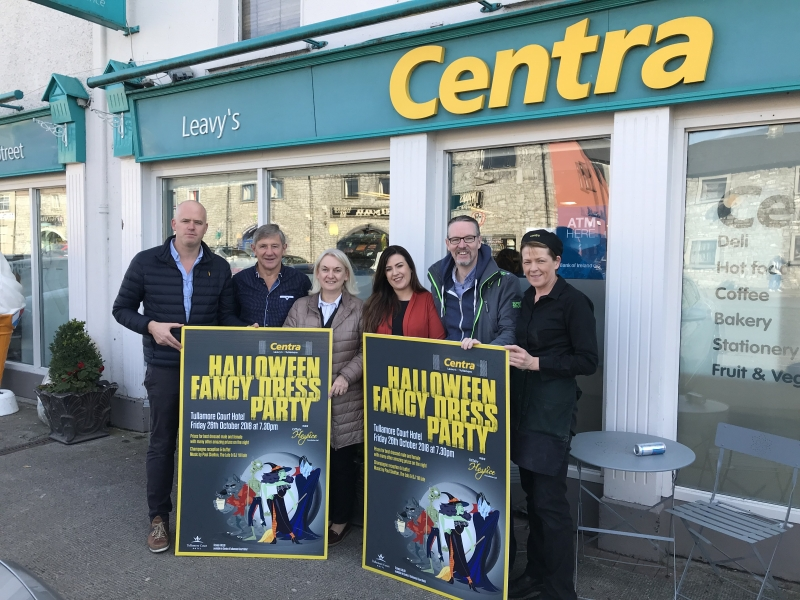 Commenting on the event, John Leavy, Centra, O’Carroll Street, Tullamore said “We are delighted to once again organise the Centra Halloween Fancy Dress Ball in aid of Offaly Hospice. Now in our 10th Year, we find it is a great opportunity for people to come together for a night out as well as raise vital funds for a tremendous cause. Our Local Centra stores are delighted to partner up with Offaly Hospice once again this year. Offaly Hospice carry out tremendous work in providing care within the community and voluntary fundraising is a vital in order for them to continue to provide services within the Offaly Area. Centra are also delighted to support Action Breast Cancer again this year. Breast Cancer is a very serious issue and one which affects thousands of families each year. Centra, through its Action Breast Cancer “Walk the walk”, and this years New Centra Rose Difuser, product sponsorship is delighted to play a role in encouraging everyone to raise monies to both fight the disease and support those directly affected.